Powerball is the son of a full sister to Dameron's First Class and when this dude hit the ground, we didn't realize just how special he was. 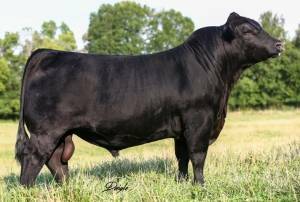 This bull has tons of Power, Big Bellied, Super Flexible, and has a look of presence that's sought after by any serious Angus enthusiasts. If his phenotype doesn't get your heart pumping, then his EPD's should.